Himachal Pradesh Board of School Education, Dharmashala is recruiting for position of Junior Office Assistant, Computer Programmer, Driver, Binder, Computer Hardware Engineer on contract basis. Last date for Eligible candidates to apply online is from 22-07-2016 to 14-08-2016. Age limit for the posts, education qualification, selection procedure & how to apply. Candidates age should be more than 18 years and less than 45 years as on 14 August 2016. For junior office assistant Candidates should have passed 10+2, Diploma in Computer Science/ Application/ Information Technology. For computer programmer candidates should be 10+2 passed and MCA. For post of Driver in HPBOSE candidates should be metric passed. For the post of Binder candidates should be 10+2 passed and should have Apprenticeship certificate. Candidates should 10+2, B.E/ B.Tech in Electronics. Candidatures will be selected on basis of Exam. Candidates have to pay 400 Rupees for SC/ ST/ OBC and Rs. 600/- for General for candidates. Candidates have to apply online before 14th August on official website www.hpbose.org. First of all Log in to website “www.hpbose.org”. 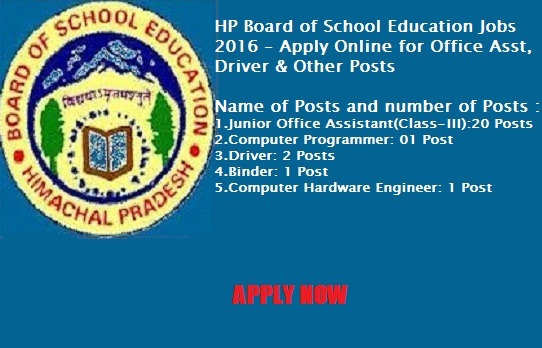 Click on HPBoSE Recruitment–2016 of various Posts. Before registration Read all the instructions carefully. Add all the details and submit the form. Don't forget to take printout of application form for future use.